A 3D rendering showing the PantoScanner floating handle. Historically, medical devices have been designed with scant regard for the end user. Although the devices may have done the job, they were often clunky and far from discreet without much thought for the ergonomics or aesthetics. This is typified by the beige boxes that are often seen in out-of-date equipment. To the industrial designer, colour and shape are much more than just making the device “look good”, they’re about creating a physical intimacy. 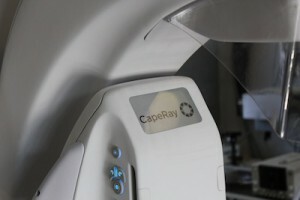 CapeRay’s PantoScanner system has been designed to be soft and tactile − encouraging the users to touch and interact with the device. For example, a common complaint during mammography is that the patient doesn’t know where to place her hands. Our solution differs radically from other mammography systems that typically have a linear metal tube stuck on the side of the machine. But how did we approach the problem? 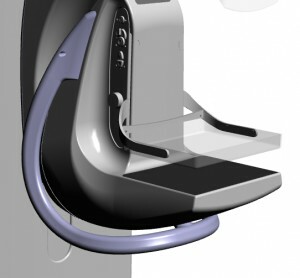 Extensive brainstorming sessions, involving industrial designers, engineers and end users − physicians, technicians and patients − were conducted and, based on this feedback, a final design was developed. Our handle (see illustration) is fabricated in one organic piece, sweeping around and under the breast platform. The curved, floating handle instinctively allows the patient to cradle the machine with a natural wrist position, thus providing a more intimate experience. A close up view of the display panel. Another problem we identified was the location of the display panel. Current mammography systems have located the display either at floor level, near the foot pedals, or above eye level, next to the x-ray tube. Ideally, the technician should be able to view the display while at the same time positioning the patient’s breast on the platform. In the PantoScanner, our display is positioned at eye level on the breast compressor so that it is easily visible to both the technician and the patient (see photograph). Having a mammogram can be stressful and thoughtful design goes a long way to make this a much less intimidating experience. In the past decade, consumer electronics has seen a shift to user-focused design appeal, which is best exemplified by Apple Inc.’s product range. Inspired by their design philosophy, CapeRay has incorporated Apple systems within its own product, the PantoScanner.